The UFC heavyweight title will be on the line in the main event of the upcoming UFC 226 pay-per-view (PPV) event, as champion Stipe Miocic is set to take on 205-pound titleholder Daniel Cormier in a super fight for Miocic’s title. That may not be the only intriguing heavyweight fight on the card though. 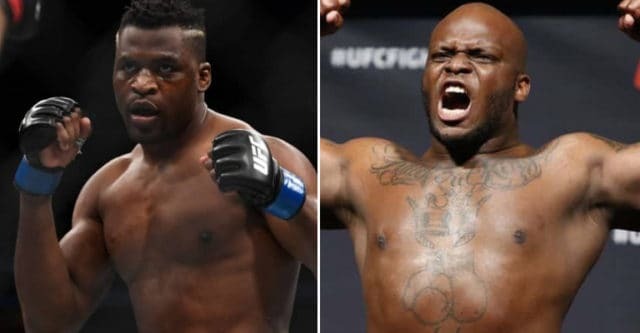 According to a report from MMAFighting.com’s Ariel Helwani, the UFC is expected to finalize a bout between Francis Ngannou and Derrick Lewis for the card in the coming days. Ngannou, one of the hardest hitters in the division, is coming off of a rather one-sided decision loss to Miocic in the main event of UFC 220 earlier this year in Boston. Prior to that, however, he had gone on a tear, winning 10-straight fights including six-straight in the UFC. Lewis, meanwhile, has also established himself as one of the division’s best knockout artists, as he’s won seven of his last eight fights. Six of those seven victories have come by way of T/KO and he’s coming off of a victory over Marcin Tybura in Austin, Texas this past February. Aside from the intriguing clash of styles that this fight will present, Ngannou and Lewis have been going back-and-forth throughout the media in recent memory, making the fight a no-brainer. UFC 226 is set to take place on July 7, 2018 during International Fight Week at the T-Mobile Arena in Las Vegas, Nevada.